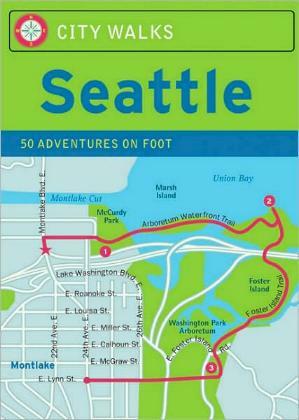 I've only spent a few hours in Seattle (the reason and story is on my Train Trips web pages), and what I did manage to see on foot, I really liked. The weather was sunny and warm, and had I had these cards with me, I'd probably have had more substance to my short visit. There's more to Seattle than one thinks: think Boeing, Microsoft, Amazon.com, Costco, and Starbucks for starters. A very picturesque part of the country, Seattle the city is pretty too. Apparently the public transportation in Seattle is a little behind other big cities, but there are buses you can take. Besides, it's a great place to walk around, the purpose of these cards. You can venture further afield on your own steam. Walks offered take one to two hours and are one to three miles, and the more difficult walks are pointed out. Places of interest you'll come across include Pioneer Square, Seattle Waterfront, Pike Place Market (fun), Capitol Hill, Seattle Chinese Gardens, and many parks. Like the other cards in the City Walks series, each card offers information on the walks and points out places of interest and a little history, and gives the bus numbers you can catch to get there. Because Seattle grew out of the need for a stop to the Klondike Gold Rush (Canada), much is related to the history of this era (late 1890s) as well as of the Native Americans who inhabited this region. Noted for being coffee-fanatics, you and locals will not run out of places to have coffee in this city. Listed are also places to grab a bite to eat or drink so everything has been thought of to ensure you are comfortable while on the move. There is a lot of water around this city, and the views and scenery are gorgeous; don't miss the chance to soak up some vistas of the water — all very calming. There also seems to be an abundance of bookstores in this city, and by all accounts, a visit to the Seattle Public Library sounds like one not to be missed. Discovery Park is great for those who prefer to be "outdoors". Of course there is also the Space Needle. Conclusion - Another lovely set of cards for those who love walking around cities.